Harper Scott’s older sister has always been the perfect one so when June takes her own life a week before her high school graduation, sixteen-year-old Harper is devastated. Everyone’s sorry, but no one can explain why.When her divorcing parents decide to split her sister’s ashes into his-and-her urns, Harper takes matters into her own hands. She’ll steal the ashes and drive cross-country with her best friend, Laney, to the one place June always dreamed of going, California. Enter Jake Tolan. He’s a boy with a bad attitude, a classic-rock obsession and nothing in common with Harper’s sister. But Jake had a connection with June, and when he insists on joining them, Harper’s just desperate enough to let him. With his alternately charming and infuriating demeanour and his belief that music can see you through anything, he might be exactly what she needs. Except June wasn’t the only one hiding something. Jake’s keeping a secret that has the power to turn Harper’s life upside down again. Review: So I had heard a lot of amazing things about this book and I really was excited to start it and I'm glad I did.I love books that have a running theme through them that you can relate to, this theme was music. From the rolling stones to the Beatles this amazing book had them all in. As I read the book it made me imagine the awesome classics playing in the background, it gave the book such presents. I absolutely love music! Music is my life and I have never come across a book that just has it present so spectacularly. The quotes used to describe music in this novel are inspiring for example "music life would be a mistake" so simple but so effective! Characters. Jake isn't your typical YA lead guy which I absolutely love. He smokes, drinks and his hair looks like he cuts it himself! But yet he is the most beautiful boy in YA I've read in awhile, he's just so cool and you can't seem to stop daydreaming about him like Harper as you read! And if a guy can write you a song then he's a keeper! The plot is beautiful. So original so marvellous. I loved how Hannah has written the road trip route. The way she writes you can literally feel the blistering heat on your skin and the emotion the Characters are feeling especially Harper. I think is a beautiful emotional story and you can defiantly relate to it if you have ever lost someone. 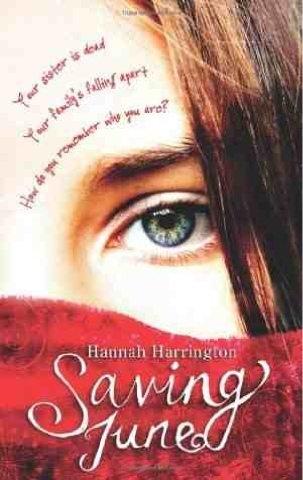 Saving june is a Sad, beautiful, for filling and tremendous story that made me swoon from beginning to end! Loved loved loved this book too! Let's go on a road trip together! But the brooding hot boy you just can't quite figure out but ends up on the road trip with us is MINE. I can't wait to read it. Heard such fabulous things about it.